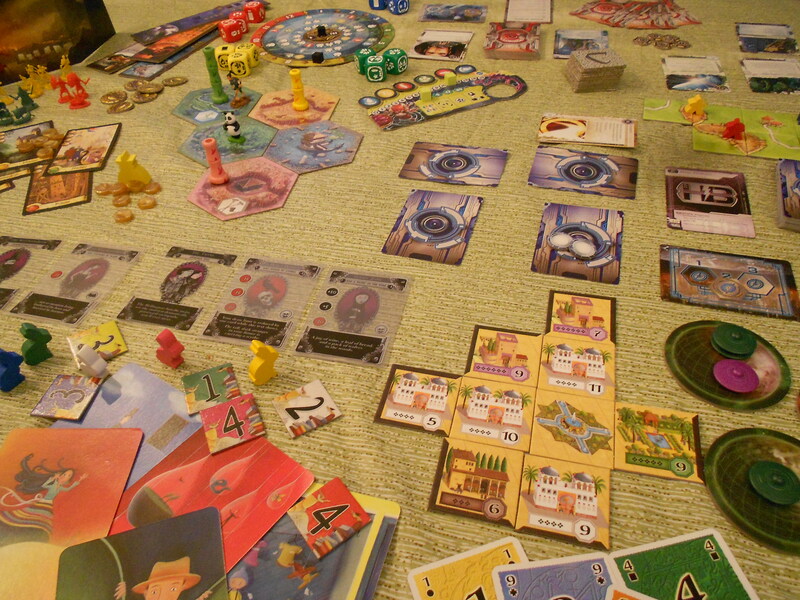 Takenoko is a light-to-medium weight euro-style game for up to four players. In the game, you are a gardener in the employ of the Japanese emperor. Unfortunately for you, the emperor was gifted a giant panda from his Chinese counterpart. The panda is now living in the imperial garden, eating all of the bamboo you are trying to grow. The gameplay of Takenoko is fairly simple. It is a tile-laying and point-taking game. At the start of a player’s turn, he draws three terrain tiles, chooses one, and adds it to the board. Bamboo shoots automatically grow one segment if they are irrigated and/or next to the garden’s central pond. The players are all dealt goal cards which offer up a certain amount of points when completed. 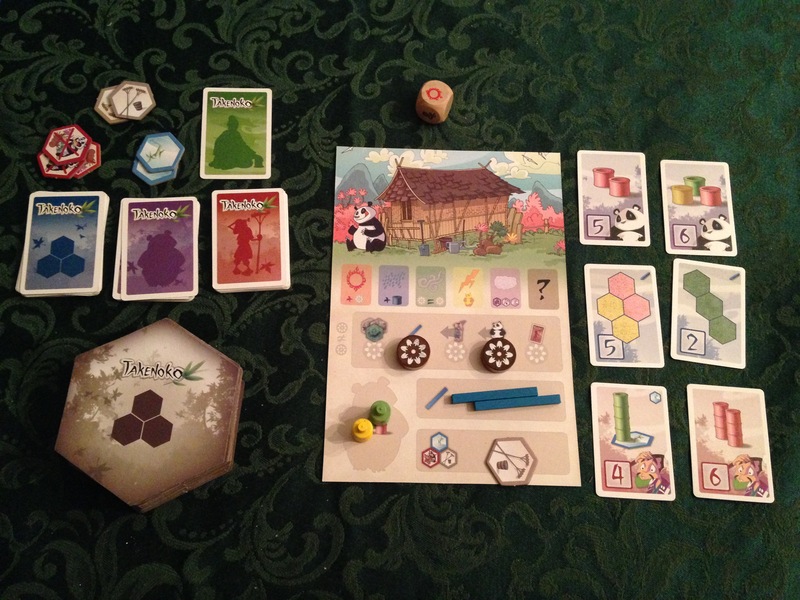 There are three types of goal cards: terrain, which offers points for laying terrain tiles in a certain configuration; gardener, for growing bamboo of certain colors and heights; and panda for eating certain colors and amounts of bamboo segments. 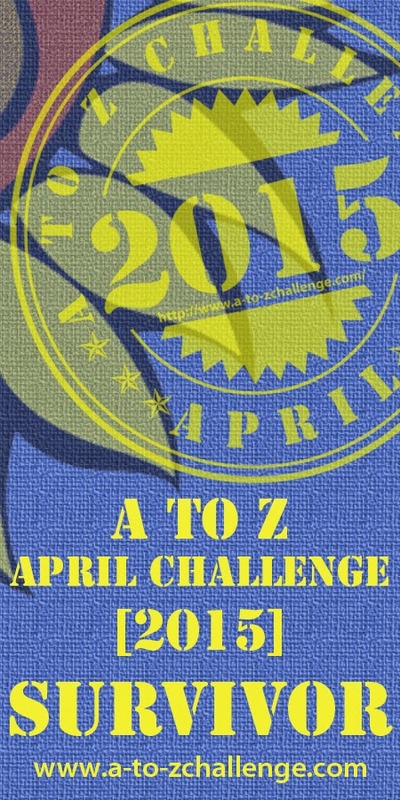 The game is over when one person has completed a certain amount of goal cards (dependent on the number of players). The points are then added up, and the player with the most points wins. 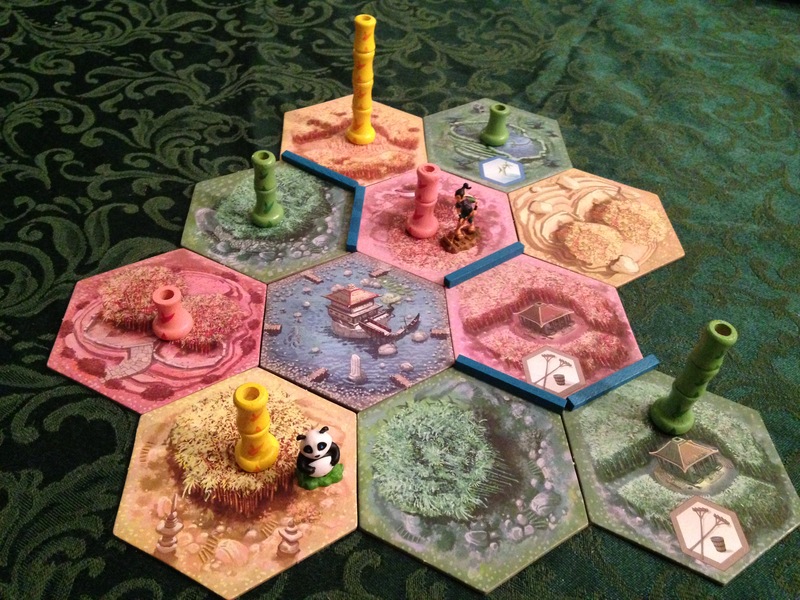 I was initially drawn to Takenoko because of it’s adorable design and theme. (I love pandas! They are so cute and pudgy!!) The thought of playing a game where a panda eats pastel-colored bamboo was just too wonderful to be ignored. What’s more, I thought the segmented bamboo stalks were brilliant. The game is just a box full of delightful colors and cuteness. In my opinion, Takenoko is a perfect game for introducing people to designer boardgames. 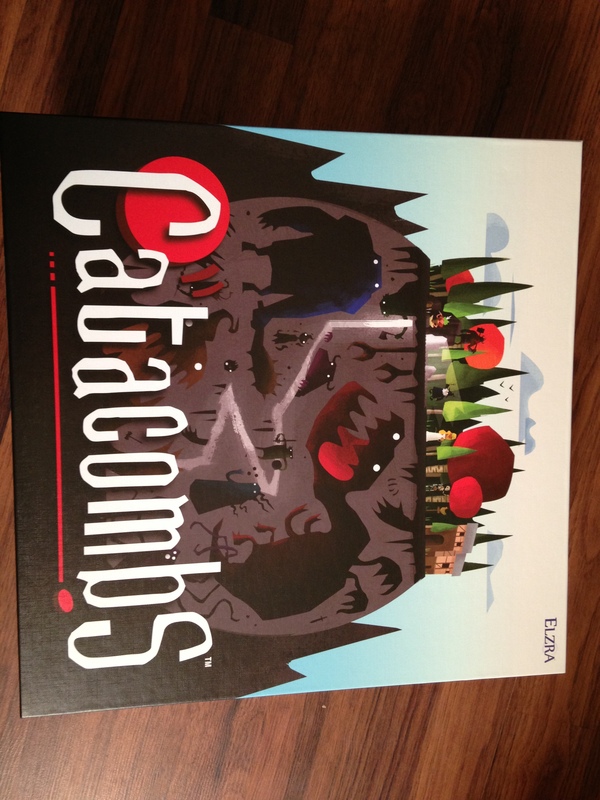 Sure, the mechanics may be simpler and a bit more random than, say, Settlers of Catan (thought by many to be the gateway game), but it’s also a game that grabs your eye. Takenoko is always the game that friends pull off my shelf and ask me to teach them. “I want to play the panda game!” they say. Who can resist those colorful components and that adorable panda figurine! Earlier this year, game designer Antoine Bauza announced an upcoming expansion for the game, thought to be ready for release by GenCon 2015. It includes a female panda figurine, nine baby panda tokens, and is called Takenoko Chibis. …Just take my money now, Bauza. I love dice. I love how they feel in my hand as I shake them; I love the anticipation that builds before letting them roll free. As far as random number generators go, dice have got to be the best. There are six-sided dice, three-sided dice, 20-sided dice. 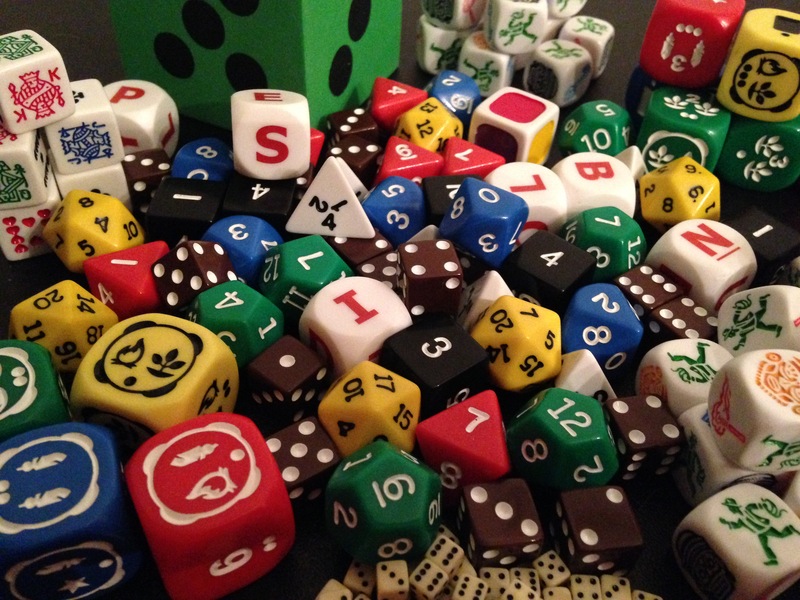 Dice with numbers, dice with pips, custom dice with special symbols or words. Multicolored dice, dice in black and white. 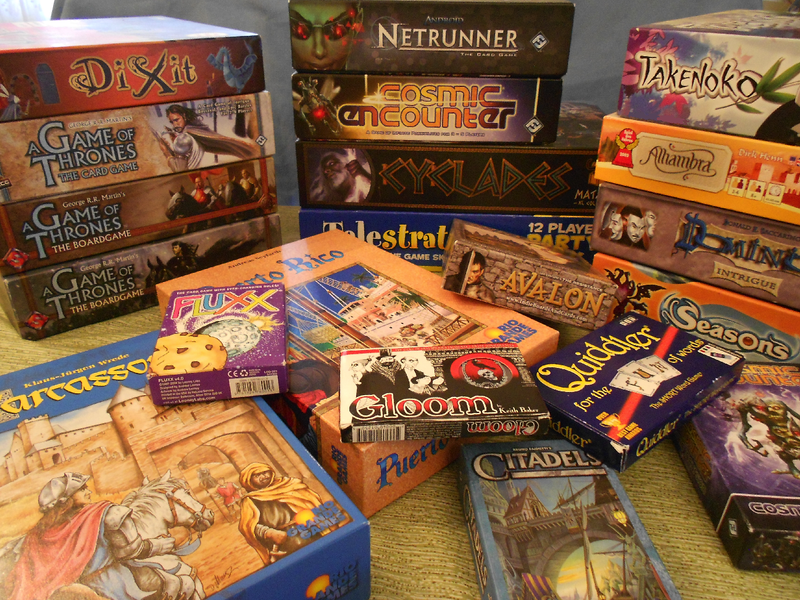 Because of the element of chance that they bring to the table, dice are frequently pooh-poohed by those gamers who seek to eliminate as much randomness from play as they can. Over Christmas break, I purchased Escape: Curse of the Temple with the thought that I could play with my family and friends over the holidays. “You just roll dice?” my eurogame-loving brother asked, a tad dismissively. He was hesitant, but I dragged him to the table anyway. “Escape!” boomed the game’s soundtrack/timer. And we were off. The sound of dice clattering on the tabletop was punctuated with squeals of joy and groans of frustration throughout the ten minutes of gameplay. The game ended with my cousin, Christina, trapped in the temple. We had lost. “This is so dumb,” my brother laughed. “Let’s play again.” And again we did. Five more games that night alone. We added the curses and treasure modules, proceeded to lose some more rounds, and then win a few. It wasn’t until a few months later that I knew my brother had been won over. As we packed for a weekend visit at my sister and brother-in-law’s place, he asked me, “Can you bring Escape?” I smiled in triumph. I love dice games. I love that dice can be the entirety of the game, such as in Yahtzee or craps. I love games that utilize dice in creative ways like using d4s as pyramids in Kemet, d6s as literal building blocks like in Blueprints, and even dicebuilding games like Quarriors! or Marvel Dice Masters. And I love games with custom dice. I think I’ve mentioned it before, but I adore quality game components, and those wonderfully chunky, colorful dice from Seasons are among my absolute favorites. Sure, dice bring randomness to gameplay. But they also bring excitement, tactility, and suspense. If you’ve played any sort of tabletop game before, odds are you’ve had a memorable experience with dice — whether it was a victorious moment when you rolled exactly what you needed, or a moment of utter calamity when you cursed your misfortune and the piece of plastic that caused it. If you do, I’d love to hear about it in the comments! What are some of your dice-related memories?